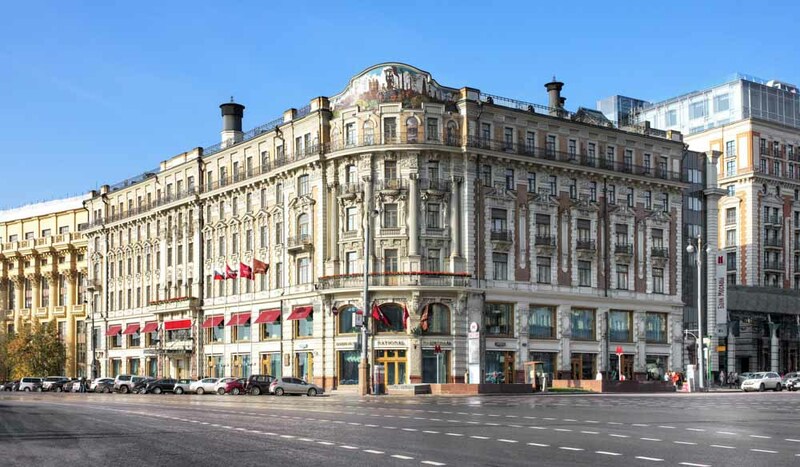 Hotel National Grand sits in the heart of Moscow. Explore the Hotel via the Grand staircase. Beautiful spacious regal rooms also come with a view of Red Square. During a harsh Russian winter, Amy McPherson checks in to one of Moscow’s most historic hotels to find warmth in old-fashioned glamour and borscht. This year marks the centenary of the Russian Revolution, and for more than 100 years Hotel National Moscow has witnessed the country’s political transformation, from imperial reign through to communist rule and the fall of the Soviet Union. Arriving in Moscow, it seems only fitting to stay in a hotel that can match the city’s fascinating history. The doorman, dressed in a long trench coat and polished leather shoes tips his top hat as I approach. “Welcome ma’am,” he says holding the door open with a gloved hand. In the reception, chandeliers hang from high ceilings; large picture windows that look out towards Red Square are framed with thick, luxurious red curtains trimmed with gold tassels; and on the opposite wall a heavily decorated mirror complements the Art Nouveau furnishings. My Junior Suite is spacious and has the same regal ambience as the reception. Everything about the room is impressive, except for the view: opening the windows I’m greeted by the sight of the roof of the bar below. Never mind; I set out to explore the hotel. 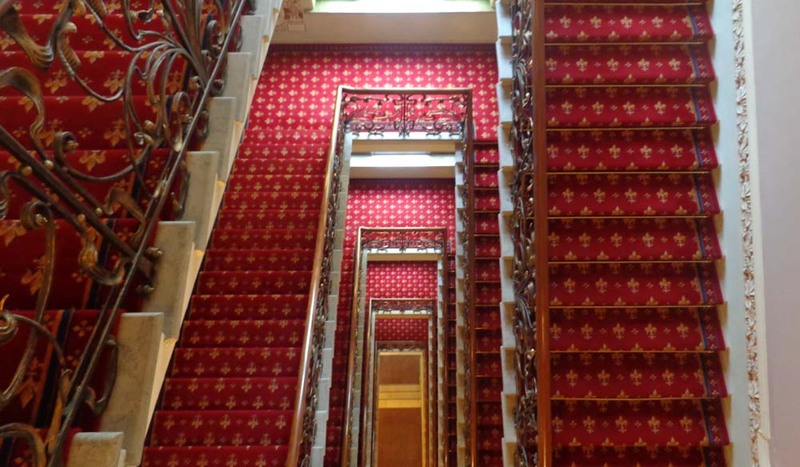 I descend via the grand staircase and follow its intricate railings, stained glass windows and royal red carpet to the second floor in search of room 107, where a plaque informs me that Lenin lived and worked here in March 1918. Intrigued, I continue further down the corridor to find a gallery of all the guests of political and social importance who have stayed here. I am surprised to find a picture of a pre-presidential Barack Obama hung not far from the portrait of Stalin. Hungry but not yet brave enough to take on Russia’s savage winter, I dine at the bar I can see from my window, Bar Alexandrovsky. At 6pm it is already busy with guests enjoying pre-dinner drinks – perhaps why the service is inconsistent. It takes a while for me to get someone’s attention long enough to ask for a menu, and another while to flag down a waiter to place my order. I order a beer (the Siberian beer is excellent), borscht (beetroot soup) and the ‘House Special’ beef stroganoff. As I wait, a woman, dressed to the nines, conspicuously loiters around the bar. Ten minutes later, a lone man approaches, pays for her drink, before the two leave together. I suspect that the hotel, as one of the oldest in Moscow, must have some tolerance for the world’s oldest profession. My food arrives and the borscht instantly warms me inside and out, while the beef stroganoff is the best I’ve had by far. The following morning there’s an excellent choice on offer at the buffet breakfast, and the dining room on the first floor has big windows with a perfect view of Red Square and the Kremlin. There is no better way to wake up to Moscow, and I dine on blinis with fresh fruit thinking of the ghosts of revolutions past. Hotel National Moscow; 15/1 Mokhovaya Str. Bld. 1, Moscow, Russia. This historic hotel has the feel of an imperial estate. Perfect for those interested in Russian history. 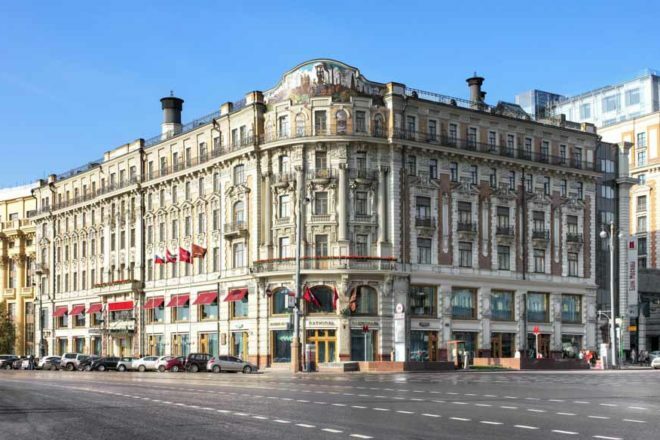 Situated just across from the Kremlin and Red Square, and a block from the Bolshoi Theatre. 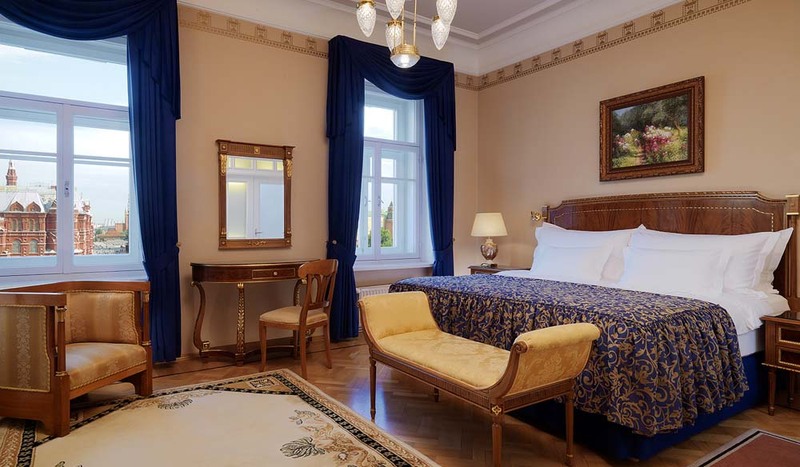 The hotel wears its history on its sleeve and has a romantic, old-school glamour. Staff have varying degrees of experience and are mostly friendly. The Junior Suite is impressive but could do with a better view. The menu has something for every taste and the bar is well stocked. I paid $517 per night; great value for a 5-star hotel of such standing.